The fast-paced nature of the tennis season strikes again as less than a day after the tournaments in Stanford and Washington concluded, the next tournament is already underway. Monday saw the start of main draw action at the 2017 Rogers Cup in Toronto. The day started with four first round matches up on the schedule – I wanted to watch all four! I got back from work in time for the end of the first match of the day on Centre Court between the number 13 seed, Kristina Mladenovic and Barbora Strycova. My first thoughts were how slow the court is in Toronto after watching tennis on the super fast courts of Stanford. The first match of the tournament saw an upset as Strycova bagged the win, 6-2 6-3. Mladenovic threatened the comeback in the second set as she narrowed the deficit from 0-4 to 3-4. In a four deuce game, Strycova needed seven game points to hold to 5-3. This proved to be the crucial game as Strycova broke Mladenovic’s serve for the win. Mladenovic looked rather lacklustre and didn’t quite seem at the races, a little like Washington. I wonder if she’s struggling with an injury or perhaps a case of burnout from the fantastic first five months of the year she enjoyed? Strycova advances to a second rounder against Daria Gavrilova (d. Lara Arruabarrena, 6-3 6-3). I’m all over Bara-Dasha which could be a cracker! The pair have never played before and are fifth up on Grandstand on Tuesday. Within the first 20 minutes of main draw action, we saw the shot of the tournament. Take a bow, Daria Kasatkina! Kasatkina’s shot is amazing, but i’m also in love with Vinci’s immediate grin and racquet clap! Kasatkina went on to win the match in two tiebreak sets, 7-6(3) 7-6(1), rallying from 2-5 down in the second set. Kasatkina played a fantastic second set tiebreak including her only two aces of the match as Vinci’s backhand slice broke down at the end. Since picking up a nasty ankle injury in Rome, Kasatkina has only played fleetingly with her two showings at the Slams. The strapping was still pretty heavy on the ankle, but Kasatkina seemed to be moving OK. A very solid win and next up will be the number five seed, Elina Svitolina in Tuesday’s evening session on Grandstand. Another great match-up to look forward to! Dominika Cibulkova scored her best win since Doha, edging past Lesia Tsurenko, 7-6(3) 6-4. The first set was very even with neither player able to build momentum. Tsurenko served for the first set and missed a sitter with an open court at *6-5 *15-0 having hit a sweet serve out wide. Looking back, it was actually the turning point in this match. Cibulkova broke back with a gorgeous volley winner and a smart loopy shot that forced the error long from Tsurenko, and she won the first set tiebreak, making less errors to take it seven points to three. Cibulkova lost her early double break in the second set, but closed out the match in style with a hold to 15. No doubt a potential upset for Domi but nicely navigated. Dominika @Cibulkova through to Second round of @RogersCup! Varvara Lepchenko ousted the French Open champ, Jelena Ostapenko in a wild and entertaining three set tussle, 1-6 7-6(2) 7-6(5). Ostapenko was in utter cruise control, leading 6-1 3-0 – so much so that I switched to another match! When I returned, Ostapenko twice broke Lepchenko when she was serving for the second set. 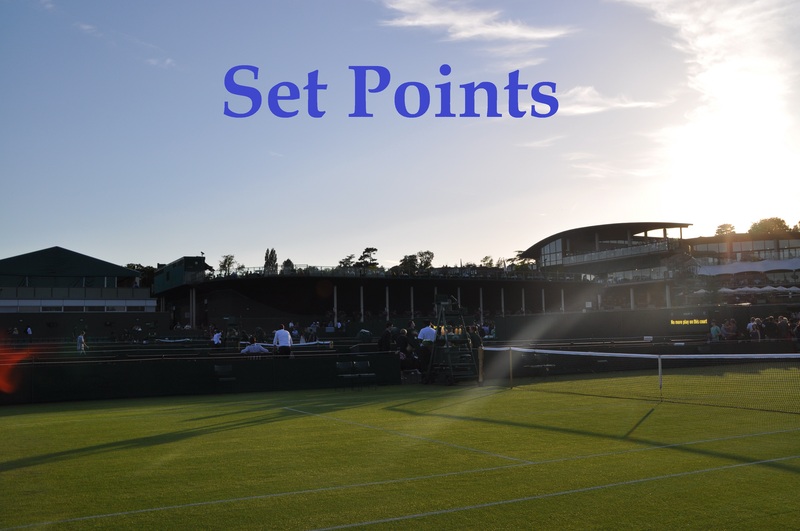 Lepchenko won the second set tiebreak handily with a return winner as Ostapenko’s serve rather fell apart as she committed her eighth and ninth double faults of the set in the tiebreak. Ostapenko really lost her way and looked almost teary at the end of the second set. The Latvian player stayed in contention as she reeled off three straight games from 2-5 to 5-5 including a magnificent game at 3-5 where she hit a sensational on-the-run forehand cross court winner. Ostapenko successfully served to stay in the match three times to force the deciding set tiebreak. Petra Kvitova snapped a four match losing streak to Carla Suárez Navarro for a superb, 6-1 7-6(5) victory. I really enjoyed the second set with Carla raising her intensity significantly from the first set and the pair playing out some super rallies. Kvitova fought back from 1-4 down in the second set. Venus Williams, Katerina Siniakova and Sloane Stephens all won their first round matches in three sets. For Venus, it was her first EVER win in Toronto as she beat Irina-Camelia Begu, 6-1 3-6 6-3. For Sloane, she won her first singles match in over a year since coming back from a foot injury – the American beat Yulia Putintseva, 6-7(4) 6-0 6-4. Stephens finds her range & her first serve after the 1st set, coming back to outgun an irritable, erratic Putintseva, 67(4) 60 64. It would seem that my body is naturally attuned to tennis as I woke up during the last match of the day on Centre Court between Lucie Safarova and Francoise Abanda. In her first match since Wimby, Lucie won, 6-4 6-4. I was nervous for Lucie in that second set – she closed it out nicely though! The number 15 seed, Anastasija Sevastova beat Lauren Davis 6-1 4-6 6-3. Davis won just 16% of second serve points throughout the one hour and 53 minute contest. Ekaterina Alexandrova needed five match points to beat Sachia Vickery, 6-1 7-6(3). Alexandrova missed four match points serving for the match at *5-4, but got it done in the second set tiebreak. Ana Konjuh and Heather Watson both retired hurt with Kirsten Flipkens and Naomi Osaka advancing to the second round. A few highlights from All-Access Hour with the top eight seeds in Toronto. What would be almost as good as being No. 1? Catching up on Sunday’s results… the Stanford and Washington finals both started at 10pm in the UK (grrr) so I wasn’t able to write about them until now. Madison Keys won her first WTA title on hard court in Stanford, beating CoCo Vandeweghe, 7-6(4) 6-4. The first set was brilliant and I though it was high-quality tennis from both players. CoCo missed some chances, but I still felt her focus was there and she didn’t drop off mentally as she has done before. I’m so thrilled to see Madison win after everything she has been through over the past year with her wrist. Also loved this too! You can see how close Madison and coach, Lindsay Davenport are and it’s a killer partnership. There was a moment in Keys’s semi-final against Garbiñe Muguruza where Davenport came on and as she left, she held onto Madison’s hand. It was a moment! The latest WTA Insider podcast with Madison Keys is one of my favourites so far this year. Madison is awesome and she’s one of my favourite players to listen to. In Washington, Ekaterina Makarova beat Julia Goerges, 3-6 7-6(2) 6-0, to win her first WTA title since 2014. Goerges had an opportunity to serve for the win in the second set at 6-5 having won four games on the trot. However, Makarova broke back to force the tiebreak and then didn’t lose another game to triumph in three sets. A few quotes from Makarova after the match. A heads up for Ilya Ryvlin (@ryvlin) and Dmitry Shakhov (@Shahovez) who are two of my favourite follows on Tennis Twitter. Big news broke on Monday around Sara Errani who will be serving a two month drugs ban – a bizarre situation! And finally, if anyone is heading to the US Open this year then please check out my guide from last year where I wrote about everything from buying tickets to experiencing all the courts. If you have any questions then please don’t hesitate to get in contact! August 8, 2017 in Set Points, Stanford, Toronto, Washington, WTA.